When I ask to see a sample, I make a decision as to whether I'd be happy to proofread it. If I don't feel it's ready for the proofread but is a genre I'm happy to copy-edit, I'll discuss this option, but if not, I will suggest the author finds a copy-editor or sometimes that they look into the option of having the work reviewed/critiqued. This is all very much done on a case-by-case basis, but I am aware that some authors are upset when I say I don't think it's ready for the proofread. I feel bad when this happens but I really am trying to do what's best for the author and the book. I could technically proofread a book with muddled points of view, plot holes and character discrepancies and that could then be published with perfect spelling and grammar, but it would be slated by reviewers and people would question the author's writing skills. If you're an author and are unclear of what the process is or what stage you're at, hopefully this blog will help to clear things up. If time is on your side and you have the funds, I think the following is a reasonable process to consider, not all necessarily costing money. The writing part of this stage should hopefully be obvious, but I know some writers who then fail to self-edit, to check the book to be sure they are happy with the story, plot, characters and details. Each author will have their own approach to this, whether they choose to have a break between writing and editing, or whether they edit as they go along, so as with most stages of writing a book, there is no one formula for all authors. Also, these two processes can be repeated until you are happy with the manuscript. There are paid-for assessment/critique services out there or you can see if you can find beta readers or members of writing groups who will do this in exchange for you reading their work at a later date. You need to make sure you ask people willing and able to offer constructive criticism so if you know your mum or wife will only be positive, are they the right people for this job? As with the first stage, this revision stage can include numerous iterations until you're happy that you've incorporated the feedback from the beta readers and any reviewers. This might involve developmental editing too, which might feel like a step backwards but might be necessary to ensure you get the best story possible. This stage shouldn't really involve dealing with major plot or character issues (that would be done in the previous stages) though any issues that have slipped through should be picked up on and the file will be sorted ready for the formatter (or formatted direct in Word or other software), as well as ensuring the writing is clear, consistent and suitable for the audience. At this stage, there should be no major changes to format, style, story or characters. The proofreader should be correcting any spelling, grammar or punctuation issues, making sure the formatting has been implemented correctly and that nothing's gone awry; the proofreading service largely involves dotting Is and crossing Ts. If you have headers/footers or contents pages, these will be checked as well as page numbers, and all prelim pages and front and back covers would ideally be there to check too. The above is very much based on the traditional publishing route, where funds and resources are perhaps greater than the average self-publishing or independent author. What this means in reality will vary from one person to the next, and it is true that some stages can be done for free or by the author, or that some can be merged. 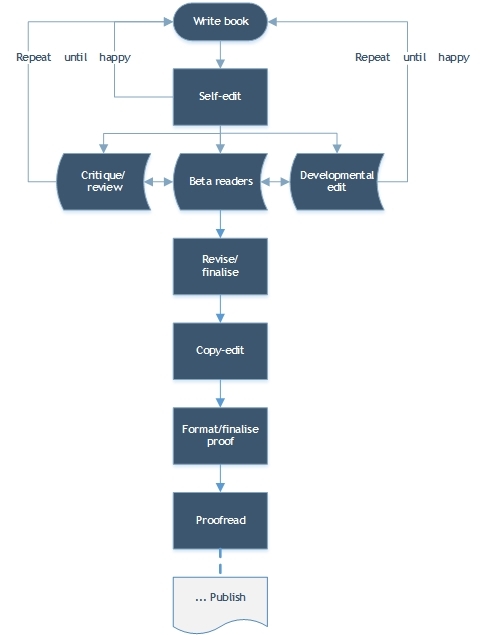 If you've had a professional edit or critique, it might be that you are confident in combining the copy-editing and proofreading service, which many might call proof-editing. The above is in no way a prescriptive process that you must vehemently follow in order to have a successful book, but it is intended to show how many stages most books go through before the proofreading process and the publication.